I completed all twenty-three of my new videos for a portion of the new Slope site. Here are a couple of related ones I finished today about rounded tops and rounded bottoms. I hope everyone had a great holiday, and so far this week the tape has been pretty tedious. However I bring glad tidings, as the pattern setup here says that is likely to be changing in the near future. I’ve included my full premarket video today just to show that even with interesting things likely to start happening on equity indices, there are still more interesting things happening on many other markets this week. Ummm – – so why on earth would this bug me? I don’t have a dog in this fight. 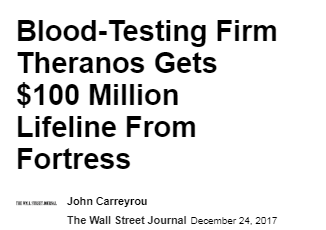 If Theranos goes bankrupt, it doesn’t hurt or help me one bit. If they become the most valuable company in the world (ha! ), the situation is the same. Utterly neutral and meaningless. So why should I care?